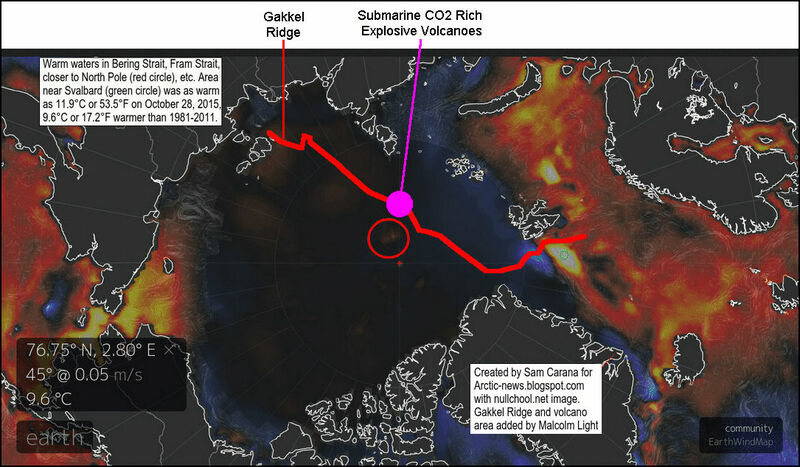 Arctic News: Methane Vent Hole In Arctic Sea Ice? Methane vent hole in the ice? Could this have been an iceberg? If so, ice concentration should have been higher, rather than lower. More likely is that this is a vent hole with methane rising through cracks in the sea ice. 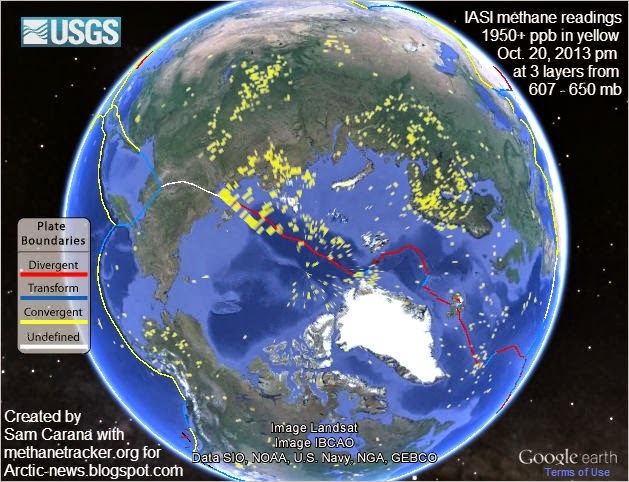 Malcolm Light comments: "The whole of the Arctic seabed is covered with methane hydrates and NASA satellites should have long ago defined where the major plumes were coming out. 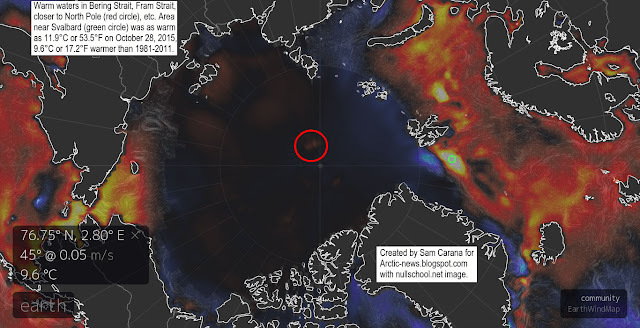 It is clearly a surface methane vent hole in the ocean ice analogous to the large methane vent holes that appeared all over northern Siberia this year. It means we have overheated the Arctic seafloor to the extent where the methane hydrates are now unstable and we could have further major releases at any time. We have already lit the fuse on a giant methane subsea permafrost bomb in the Arctic which can go off at any moment." 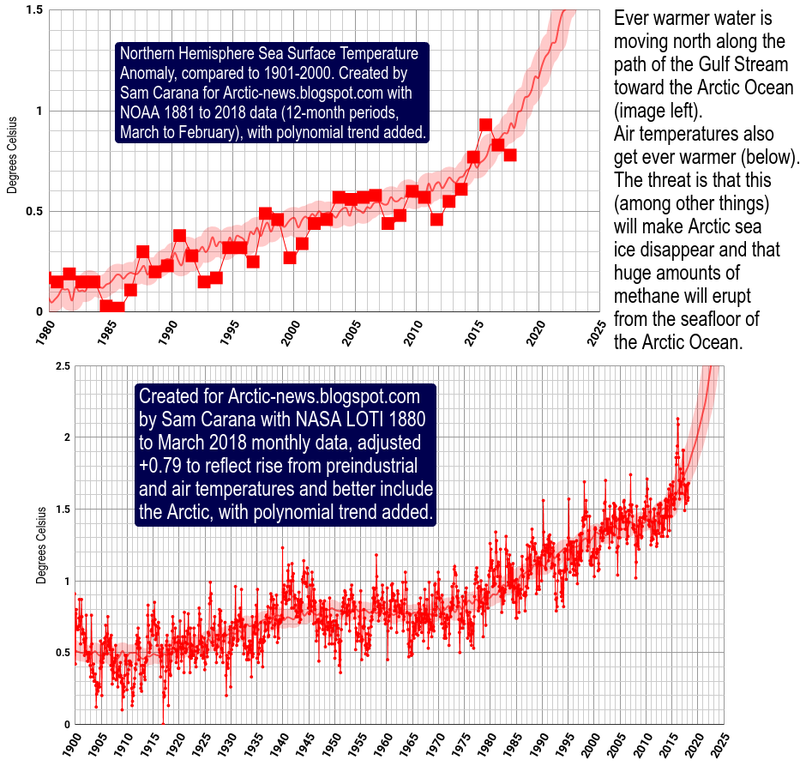 Roger Caldwell responds: "I think it's upwelling warm water. There is a ridge right below the spot. I can see warm spots through the ice on the nullschool program. The warm water comes through the Bering Strait and sinks to the mid levels. When it gets to the ridge it flows upward, making a temporary polynya." 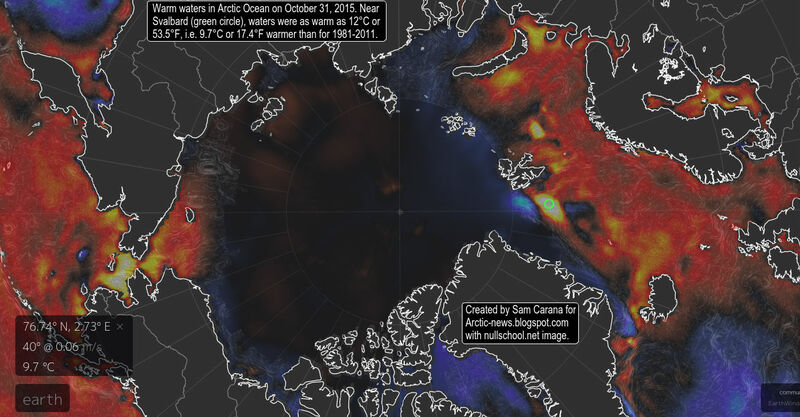 The image below shows warm water entering the Arctic Ocean from the Pacific Ocean (through the Bering Strait) and the Atlantic Ocean, with the dark-red color of many areas in the Arctic Ocean indicating warm waters, including an area close to the North Pole marked by the red circle. So, the spot could indeed be a polynya caused by upwelling of warm water. Alternatively to the Pacific Ocean, the warm water could have originated from the Atlantic Ocean. In the Fram Strait, near Svalbard, sea surface temperatures as high as 11.9°C or 53.5°F were recorded on October 28, 2015, i.e. 9.6°C or 17.2°F warmer than 1981-2011 (at the location marked by the green circle). 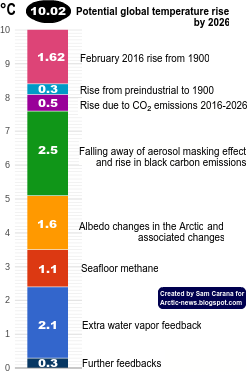 Of course, with water this warm reaching the center of the Arctic Ocean, the threat that this will cause (further) destabilization of methane hydrates at the seafloor of the Arctic Ocean is equally ominous. 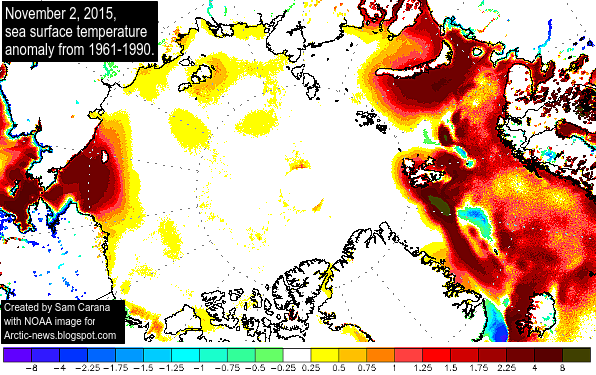 The more recent image below shows warm waters in the Arctic Ocean in a different way, partly because the anomaly is calculated from the period 1961 to 1990. The image below shows that sea surface temperatures as high as 12°C or 53.5°F were recorded near Svalbard on October 31, 2015, i.e. 9.7°C or 17.4°F warmer than 1981-2011 (at the location marked by the green circle). On the image below, Malcolm Light added the Gakkel Ridge, i.e. the fault line that extends on the seafloor of the Arctic Ocean from the northern tip of Greenland to Siberia (red line), and the location of explosive volcanoes (lilac spot), with content from Sohn et al., 2008. 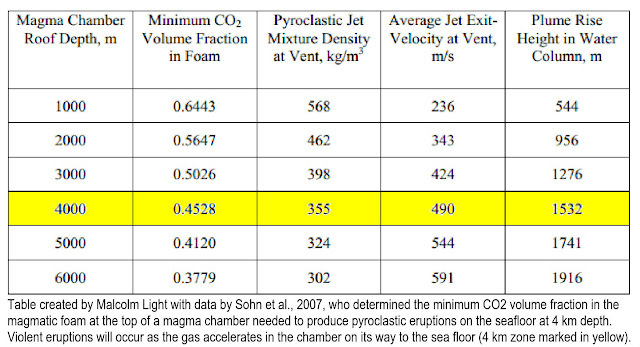 The table below shows the height that emerging carbon dioxide plumes can be expected to reach for a given carbon dioxide volume fraction in the foam at the top of a magma chamber. "Sohn et al. (2007) outlined how the sequence of extreme pyroclastic eruptions occur along the Gakkel Ridge (85°E volcanoes) at an ultra-slow plate spreading rate (<15-20 mm/year). These volcanoes formed from the explosive eruption of gas-rich magmatic foams. Long intervals between eruptions with slow spreading caused huge gas (volatile) build up high storage pressures, deep in the crust. Extension of the 85°E seismic swarm occurred over 3 months but later earthquakes were caused by large implosions from the explosive discharge of pressurized magmatic foam from a deep-lying magma chamber through the fractured chamber roof which rapidly accelerated vertically, expanded and decompressed. There were many periods of widespread explosive gas discharge from 1999 over two years detected by small-magnitude sound signals from seismic networks on the ice. Pyroclastic rocks contain bubble wall fragments and were widely distributed over an area of more than 10 square km. Deep fragmentation was caused by the accumulation of a gas (volatile) foam within the magma chamber which then fractured, formed a pyroclastic fountain 1-2 km high in the Arctic Ocean and spread the pyroclastic material over a region whose size was proportional to the depth of the magma chamber (see above table). A volatile carbon dioxide content of 14% (Wt./Wt. - volume fraction 75%) is necessary at 4 km depth in the Arctic Ocean to fragment the erupting magma." As said, with water this warm reaching the center of the Arctic Ocean from the Atlantic and Pacific Oceans, the threat is that added heat from volcanic activity or pressure shocks from underwater earthquakes or landslides will trigger (further) destabilization of methane hydrates at the seafloor of the Arctic Ocean. Below follows some more background. Naval Research Laboratory 30-day animations are added below for temperature, concentration, salinity and thickness of the sea ice. Click on each of them to view full versions. 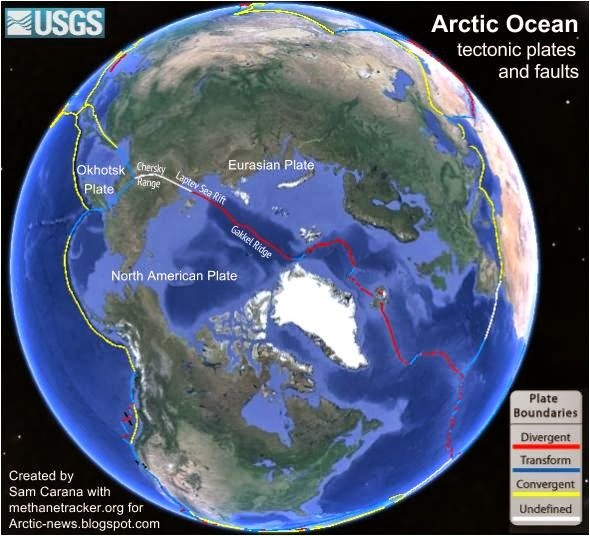 A major fault line crosses the Arctic Ocean, forming the boundary between two tectonic plates, the North American Plate and the Eurasian Plate. These plates slowly diverge, creating seismic tension along the fault line. From where the Mid-Atlantic ridge enters the Arctic Ocean, it is called the Gakkel Ridge. The fault continues as the Laptev Sea Rift, on to a transitional deformation zone in the Chersky Range in Siberia, then the Ulakhan Fault between the North American Plate and the Okhotsk Plate, and then continues as the Aleutian Trench to the end of the Queen Charlotte Fault system. High methane readings were recorded for a period of just over one day, October 19 - 20, 2013, as shown in the images below. Indicated in yellow are all methane readings of 1950 ppb and over. Satellite measurements recorded methane readings of up to 2411 ppb on October 20, 2013. 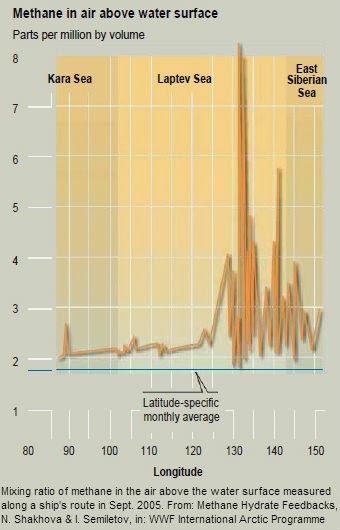 For further reference, large amounts of methane have been venting in the Laptev Sea area in previous years. Added below is an edited part of a previous post, Unfolding Climate Catastrophe. 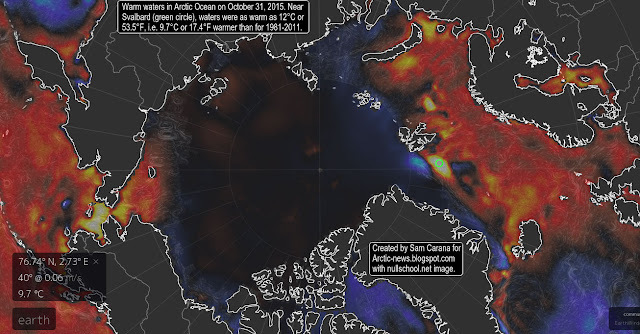 The image below shows high methane concentrations over the Arctic Ocean on October 11, 2015, pm, at 840 mb, i.e. relatively close to sea level. 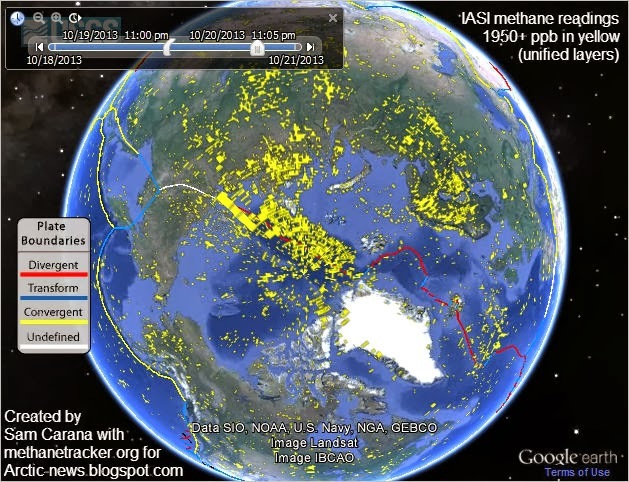 The image below shows high levels of methane over the Arctic Ocean at higher altitude (469 mb) on October 28, 2015, pm, when methane levels were as high as 2345 ppb. Note that the above two images have different scales. The data are from different satellites. The video below shows images from the MetOp-2 satellite, October 31, 2015, p.m., at altitudes from 3,483 to 34,759 ft or about 1 to 11 km (241 - 892 mb). 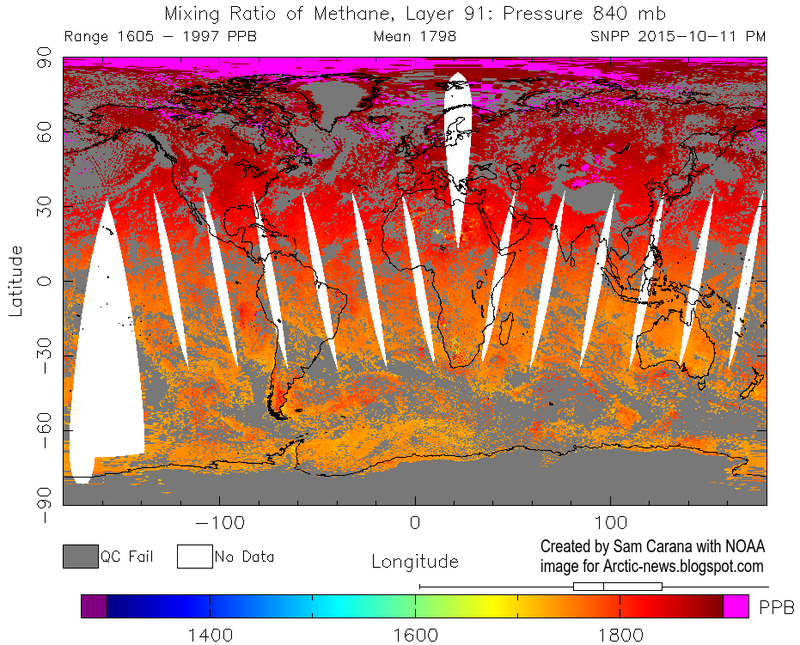 Peak methane levels were as high as 2450 ppb on November 1, 2015. 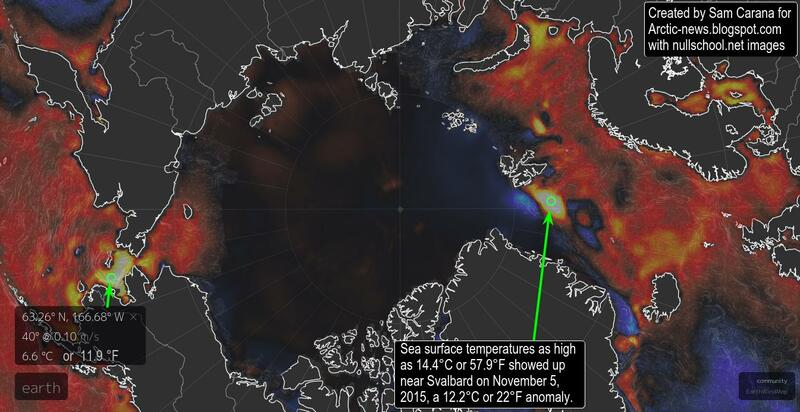 On November 5, 2015, sea surface temperatures as high as 8.5°C or 47.3°F showed up in the Bering Strait, an anomaly of 6.6°C or 11.9°F, while sea surface temperatures as high as 14.4°C or 57.9°F showed up near Svalbard on November 5, 2015, a 12.2°C or 22°F anomaly. The situation is illustrated by the image below. These high temperatures indicate that the sea can be a lot warmer below the surface than at the surface, and it appears that very warm waters are continuing to enter the Arctic Ocean from both the Pacific Ocean and the Atlantic Ocean. 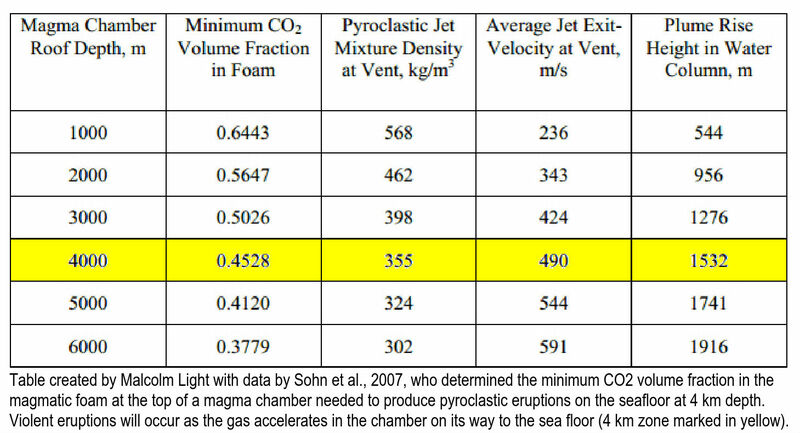 As discussed in previous posts such as this one, the danger is that ever warmer waters will (further) destabilize methane hydrates at the seafloor of the Arctic Ocean, resulting in abrupt methane eruptions that could dwarf the impact of existing greenhouse gases in the atmosphere. If those "holes"? are from methane venting, they must have been HUGE to show up on those satellite images! 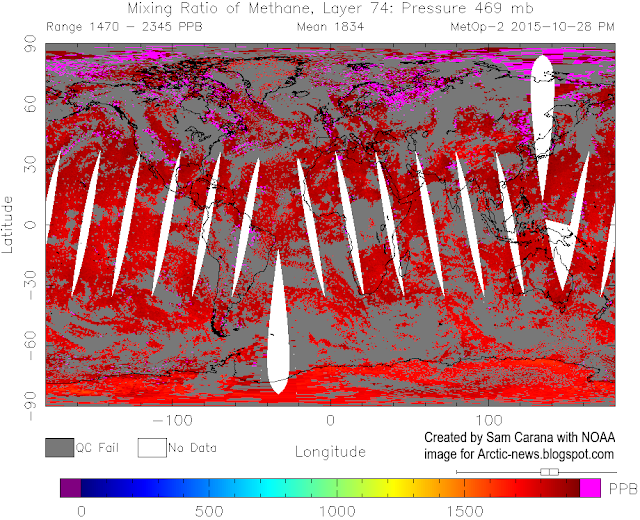 Too bad the Methane tracker is gone. Can someone report back if its a data error? Great post by the way. I have no reason to believe that the spot showed up as a result of any glitch in the system. Spots like this have showed up earlier, and it's good to analyze and monitor them more closely. That looks like its coming from the subduction area where the crust formed by gakkel goes under the Eurasian plate. There are huge accumulations of hydrates there from abyssal ooze rich in organic matter being scraped off. The increase in central Greenland ice mass from higher precipitation pumps superheated basalt magma to the spreading ridge in deep conduits. Hence increase in earthquake and volcanism there. Probably that destabilizing those clathrates. They are in deep water layers that don't mix with several layers above in arctic hydrological system.